Pinkadots Elementary : Getting Acquainted with Pinkadots! 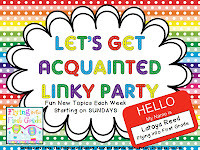 I love these fun linky parties to get to know more of my blog friends. Since Pinkadots Elementary is a two teacher team, normally when you see posts they are from me, Theresa. We are both 4th grade teachers in the same school, plan together, teach together, go out together, our kids are BFF's & go to daycare together, and we talk 24/7. So it is only right that I am making Robyn get on board with blogging. She is seriously my other half and I don't know how I survived all those years without her. We are so much alike at certain things, but SO completely opposite at the same time. We met at school (when she was the evil, cute, new, younger (only by a year) teacher that moved in and kicked me out of my classroom, but that's a different story!) It is my Summer goal....make Robyn a tech nerd like myself! She already thinks I'm nuts with these blog linky parties and giveaways and posts, but secretly I know she loves it! ;) Maybe you will all get really lucky and we will take a picture from our SPA DAY tomorrow and post it so you can see who we really are! Anyways I/WE are linking up with our friend LaToya from Flying into First Grade. This week the topic is a Skittles Party & since I have a CRAZY obsession with skittles, how could I resist the post!? MMM, those ice cream flavors are good! Just love your blog! My partner teacher and I also work on our blog together and we have just discovered these linky parties (which we love!). Theresa - I also can't wait to move someday!! Happy to be your newest follower! I've never had mint Oreo but mint chocolate chip is my favorite so I might need to check it out! Hahaha whoops I just realised i should have said my favorite memory was meeting my (now) husband- although when we first met we hated each other because we were both competing for top of the class! hahaha! I think organization always makes things so much better!